It might be better to just Exclude taskmanager because settings the Flag value to 0 might disable multi monitor support. To do this Create a new REG_SZ (string) under HKEY_LOCAL_MACHINE\Software\Citrix\CtxHook\AppInit_Dlls\Multiple Monitor Hook and name it Exclude. It’s value should be taskmgr.exe (case sensitive!). I’ve also seen some issue where starting a Remote Desktop (RDP) session from within a Citrix session has some troubles with the RDP client’s window (the window “sticks” to the upper left corner or cannot be maximized). So it might be a good idea to include mstsc.exe as well in the Exclusion list (seperate values with ;). The issues seem to have appeared with Hotfix Rollup 2. Today I noticed something strange: on a Citrix (Presentation Server 4.5) server taskmanager does not show anything in the applications tab. I tested this on the other Citrix Servers in the farm and they all had the same problem (and non Citrix servers did not). 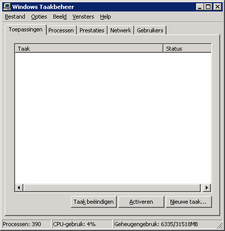 As you might know taskmanager fills the applications tab by enumerating all top level windows. That’s why I suspected Citrix because it places several hooks (multi monitor support, speedscreen etc.). Turned out that by setting the Flag value of the HKEY_LOCAL_MACHINE\Software\Citrix\CtxHook\AppInit_Dlls\Multiple Monitor Hook from 4 to 0 fixed the issue.